with black and white fabric's. It's very dramatic and has amazing energy -- almost feels like waves of fabric rolling across the face of the quilt but ... to me, it feels 'unanchored' because of the contrasting borders. I think I'd've liked the darker border all around, but I can well understand the continuation of the theme even out into the border. My sister saw this in one of my magazines and fell in love. So I made it for her. Lucky sister! I'm sure she loves it! Pam doesn't know anything about it. I can't get it finished completely before September, as the backing is over with her. But I will take the top to show her when I go.. Thank you. I like working with black and white fabric's. I do find it hard on the eye's though. I really like it - I love anything monochromatic. I bet it was quite hard finding that many suitable b&w fabrics? Thank you...This was a kit, pattern plus fabric, so I was spared the running all over looking for fabric. 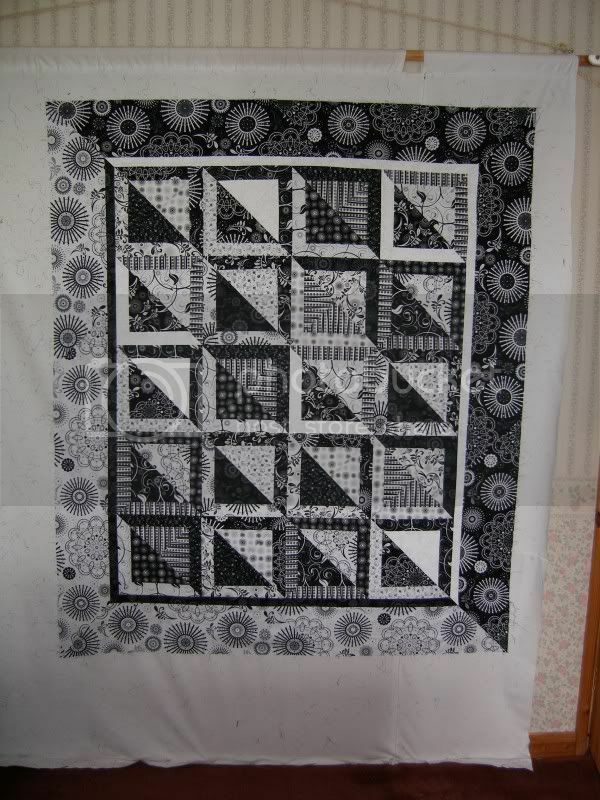 I must admit all the B/W fabric's I used in the GMO quilt. I sent to the States for them...I'm always ready to help. Thanks sweetie... I'm hoping my mate will really get into quilting - she's incredibly artistic, but with no real outlet for her talent at the moment. My sister saw this in one of my magazines and loved it. It was a kit, pattern and fabric. I hope she still likes when I take it to her. She doesn't know about it at all. That is ABSOLUTELY stunning! I would never have been able to even picture something like that - but man, that is spectacular! I love it when you experiment! Thanks Aly. I am not the brains behind the pattern, but I loved the way it looks. Might try this pattern again with two different colours.